Whilst many of us over the Christmas period were enjoying our turkey, opening presents, and sitting down to watch the Queens speech; lots of others throughout the UK were forced out of their homes due to Storms Desmond, Eva and Frank. Throughout December record levels of rainfall were recorded and as a result that we are all aware of, many parts of the UK were flooded beyond belief. Unless you are already aware that you live in an area common for flooding, none of us ever think that this will happen to us. Whether it is complete devastation due to flooding, wind, or other stormy conditions it is difficult to be completely prepared to the effects that a powerful storm can have on your home and life going forward. With this in mind we thought it would be a great idea to look at some of the key tips for preparing for future weather damage, and what to do if your home is damaged as a result of weather. As you would expect getting insurance is the first thing you should do to ensure that you are prepared for future damages to your home. Most home insurance will offer some form of cover for weather damage, but it is crucial that you check the details of your own policy to work out exactly what is covered. If you live in an area that is at risk of flooding then it is important to be honest during your policy application as any false information can affect future pay-outs on your policy. If you are not sure whether you live in an at risk area then why not check out the Environment Agency’s flood map for England and Wales or the SEPA website if you live in Scotland. If you live in a new-build then it is likely protected by the NHBC 10 year Buildmark Warranty, just as Green Spinnaker homes are. It is important to be aware that damaged caused by storms, flooding and other severe weather conditions are not covered as part of this warranty. You must ensure that you have your own insurance to protect against this. You can find out more about what is and isn’t included in your NHBC Buildmark Warranty here. Insurance is essential, and any home owner should have it. But what you may not be aware of, are some key tips of what you could do to limit the risk of damage to your property. 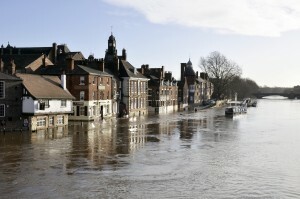 Warning – SEPA and the Environment Agency have flood risk warnings so ensure you are signed up for these alerts. Danger Areas – protect danger areas which could be most at risk such as doorways, airbricks and backflow popes. Be prepared – review the threshold of your property to look for weak spots. You can then think about raising door thresholds or damp-proof courses, applying water-proof sealant to walls. Temporary Flood Barriers – in addition to changes you can make to your property, flood barriers can be an extra defence to flooding. Strong winds – If the storms are more about the wind than the water, you can make sure that any fixings to the roof like TV aerials or telephone lines are very securely fastened. Also be mindful of any large trees in your garden that could be blown over onto the house. Regular professional tree surgery will make sure that old or weaker trees do not become a hazard in storm winds. Limit damage – sometimes water just can’t be stopped so if you have multiple floors, move as many furnishings and valuables upstairs if you have time. If your home suffers damage due to weather then, dependent of the extent of the damage, you may not be able to return to your home immediately. You should contact your home insurer as quickly as possible, they will be able to provide additional advice and possibly alternative accommodation. To assist with your insurance claim, it will be useful to take any pictures or video evidence, especially if you need to make temporary repairs to protect your home from further damage; however don’t make any permanent repairs before your insurance company has been able to visit. Overall, weather damage to your home can be one of those unavoidable circumstances, but being prepared by following the advice above can help to minimise the disruption and damage to your home or property. At Green Spinnaker we like to keep unforeseen circumstances, like damages caused by weather, in mind when we design and build our houses; so we thought we would give you a little teaser of our up and coming development which has been designed with semi-basement garages which means that the ground floor is 4 foot above ground level. As a result this removes the risk of flooding to the main kitchen and lounge areas. If you want to be kept up to date and find out more about our future development register interest today. This entry was posted in Home Lifestyle on January 26, 2016 by Sue Blatchford.